The Brickell City Centre is developed by the Swire Properties & designed by the Miami based Arquitectonica. The five million square foot complex opened for business in late 2016, it spans more than 9 acres & includes 3 levels of retail-shopping, 2 office towers & a 352 suite East Hotel. Yet to be completed is an 80 story mixed-use tower that is to be built on the east side of the mall & it is said to be among the tallest structures in Florida upon completion in 2019. It’s an ambitious project, which will fundamentally re-shape the Brickell neighborhood, with over 500,000 square-feet of retail-shopping, both mid-priced and luxury, 260,000 square-feet of office space & 1 million square-feet of residential areas. The center’s retail section includes luxury brands at the ground level & premium retailers are housed on the second & third levels, including Bally, Valentino, and Apple. The center has 3 principle anchor-tenants namely, the La Centrale, the Saks Fifth Avenue, and the Mexico based luxury dine-in theater CMX. The Brickell City Centre also has its own transit station at the Eighth Street Metro mover & a big underground parking area. The vibrancy of the city penetrates straight to the heart of the center, & this is what protects it from being just another sealed, soul-less mall. It is grounded, open and inviting. The center’s architecture doesn’t scream out for attention. The blocky masses are discrete and hover away from the grid. Within the multi-level retail complexes, natural light is able to penetrate from every direction. The walls are constructed of narrow and horizontal panels, aluminum coated detailed with a metallic paint which produces a reptilian texture, that absorbs light in some areas, deflecting it in some others. 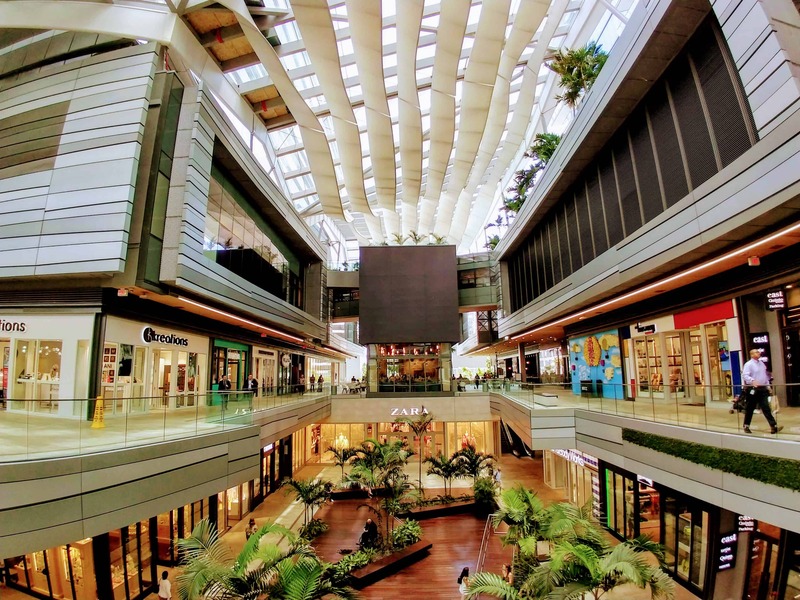 Unlike most retail malls, the shops at the center face both inward for a natural lushly landscaped esplanades and outwards to the street for a further activated perimeter. The walkways are merely staggered back for people to look down & and have a sight of the different levels. One of the most eye-catching features at Brickell City Centre is the “Climate Ribbon” which flows between and above the buildings offering a pale river-like feature. The ribbon is designed for both airflow and shade. In some areas, it dips; in others, it turns, filtering the light. The Climate Ribbon also catches & filters rainwater which in turn is recycled to water the planted terraces. Another equally attractive feature is the upper-level landscaping plan where tropical plants and natural grasses give the tower an outside look. Unfortunately, much of it can only be visible from the higher level commercial or residential spaces which aren’t open to the public. Swire Properties has many development projects under its belt including highly successful retail malls in Mainland China and Hong Kong; however, this is the first major project they are engaged in the United States. Generally speaking, the Brickell City Centre has a kind of cinematic vision in play, with crossovers, metallic canyons, suspended walkways, cascading escalators, and skewed lines of sights. There is a feeling of urban life, complexity, and excitement. It also attracts many surrounding businesses to spend their lunch break there or stop by for a drink after work. This keeps the Brickell City Centre from being just another hermetically sealed mall. If you are in the neighborhood, stop by and check it out, you won’t regret it.